Hamburger soup is a hearty soup! One that most men even enjoy. The weather has been rather chili around our neck of the woods and so I decided that I would make some soup. It went from 90 degrees to 60 degrees and this morning when I got up it was 48 degrees. I thought, I sure hope that my tomatoes don’t freeze, and it is too cloudy to tell if we got more snow in the mountains. Where we live, there is a mountain that when the snow melts down it, it looks just like a horse. They call it the snow horse. When you see the snow horse, one knows that it is time to plant tomatoes. I did that a few weeks ago, however I am hoping that when the clouds go away that the snow horse will still be there. It has worked every other year, but the weather has been very different this year. Isn’t nature a wonderful thing and very smart too? 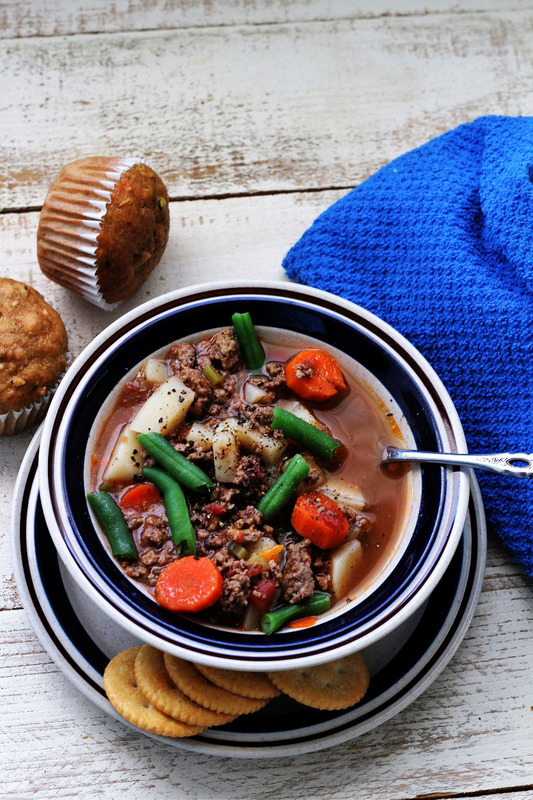 That is one of the benefits of this amazing hamburger soup. It is loaded with wonderful things from the garden, like tomatoes, carrots, and potatoes. You could put just about any vegetable that you like in it. Make it according to your family’s wants and needs. My oldest son said that it wasn’t too bad because it had something to chew in it. He doesn’t really care for soup because he says that most soup is like drinking water and that doesn’t fill you up. 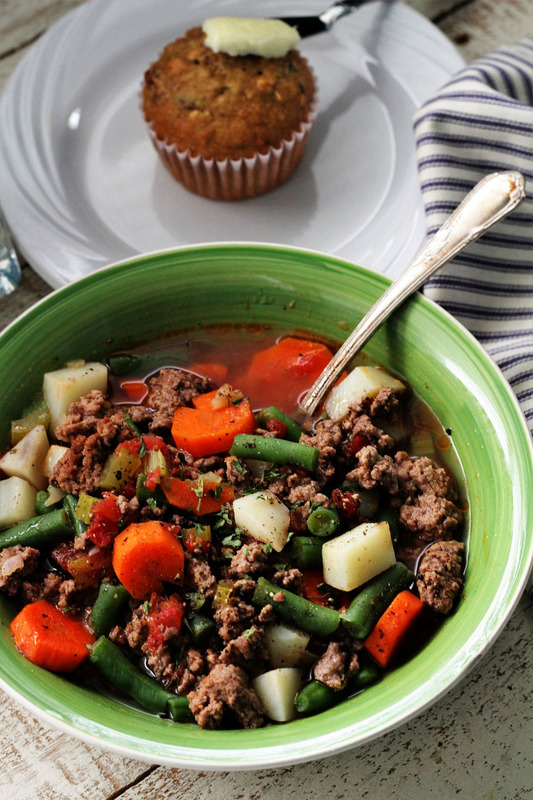 He did say that this hamburger soup was pretty good. So that is always a bonus. Add a muffin, a slice of bread or roll, and you have a wonderful dinner. I remember that once when my mom made soup, my friend talked me into loosening the pepper lid. So when my brother went to sprinkle some pepper onto his soup, yep you guessed it, the whole pepper shaker dumped right into his bowl. My mom told me that I had to trade bowls with him. There was never a lot of food left over at my house, because I was the youngest of 8 children. I was very nervous, because I didn’t want to eat all that pepper. However, I did learn a lesson not to play a joke on my siblings at the table. Don’t mess with something that you are not willing to eat yourself! By the way, I didn’t have to eat it. Phoof! Now as a parent, I don’t think that I would be very happy if my kids did that either. Moms and dads go to a lot of work to put food on the table and to prepare it too. Thanks to all of those who have ever fixed meals for me. 1- If you have any left over vegetables, they go very well in this soup. 2- I buy my ground beef in bulk. When I get home, I cook some of it on a cook sheet in the oven @350 degrees, for around 3045 minutes. Then I put it in freezer bags, and when I make this soup it comes together a lot quicker because the ground beef is already cooked. In a large sauce or cast iron pan, brown ground beef, then drain. Add dried onion, salt, pepper and oregano. Stir until blended. Then add the carrots, potatoes, celery, tomatoes and boil. 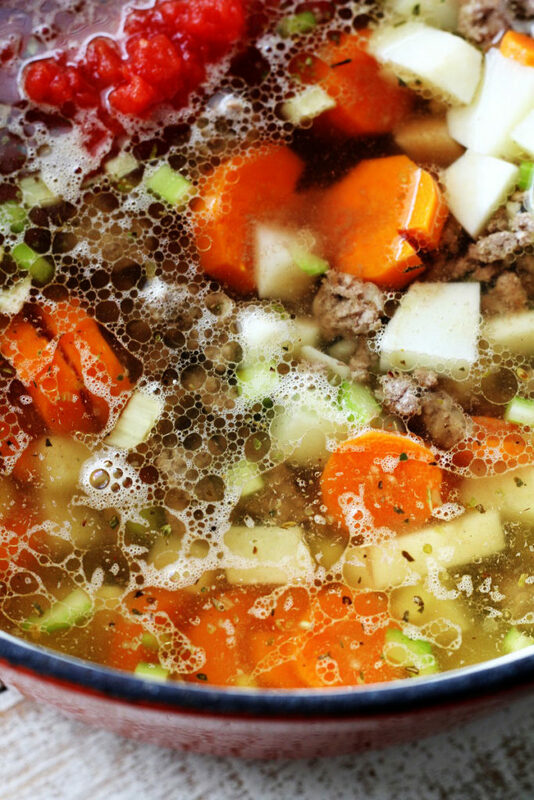 Simmer for 15-20 minutes or until the potatoes and carrots are tender. Place green beans in the pot and cook for an additional 10 minutes or until beans are tender.